New all-analog circuitry features pure Ampeg tone in rugged designs perfect for any pedalboardWoodinville, WA, USA – May 2, 2017 – Ampeg’s hotly anticipated additions to its lineup of pedals are now shipping and available. Launched at the NAMM Show in January, the Classic Analog Bass Preamp and Scrambler Bass Overdrive pedals join the popular SCR-DI Bass DI, delivering authentic Ampeg tone at amazing prices. Woodinville, WA, USA – May 2, 2017 – Ampeg’s hotly anticipated additions to its lineup of pedals are now shipping and available. Launched at the NAMM Show in January, the Classic Analog Bass Preamp and Scrambler Bass Overdrive pedals join the popular SCR-DI Bass DI, delivering authentic Ampeg tone at amazing prices. The Classic Analog Bass Preamp pedal allows the player to dial in a wide range of authentic Ampeg tones with the 3-band tone stack and highly flexible Ultra-Hi and Ultra-Lo circuits. The Scrambler Bass Overdrive pedal delivers a huge range of overdrive, from subtle to screaming. Players can add in a touch of highs, then blend in with the dry signal to create their custom Ampeg tone. Both pedals feature an all-analog, true bypass design with class-leading signal-to-noise ratio built into all-metal enclosures made to survive the rigors of the road. Thanks in large part to the runaway success of the SCR-DI Bass DI, the two new pedals have created quite a buzz since their introduction in January. Now bassists everywhere can get their hands on them. For a video overview of the new pedals, visit https://www.youtube.com/watch?v=QHHG21cvHLE. For more details and info on other great Ampeg products visit www.ampeg.com. The Classic Analog Bass Preamp and Scrambler Bass Overdrive pedals join the popular SCR-DI Bass DI, delivering authentic Ampeg tone at amazing prices. 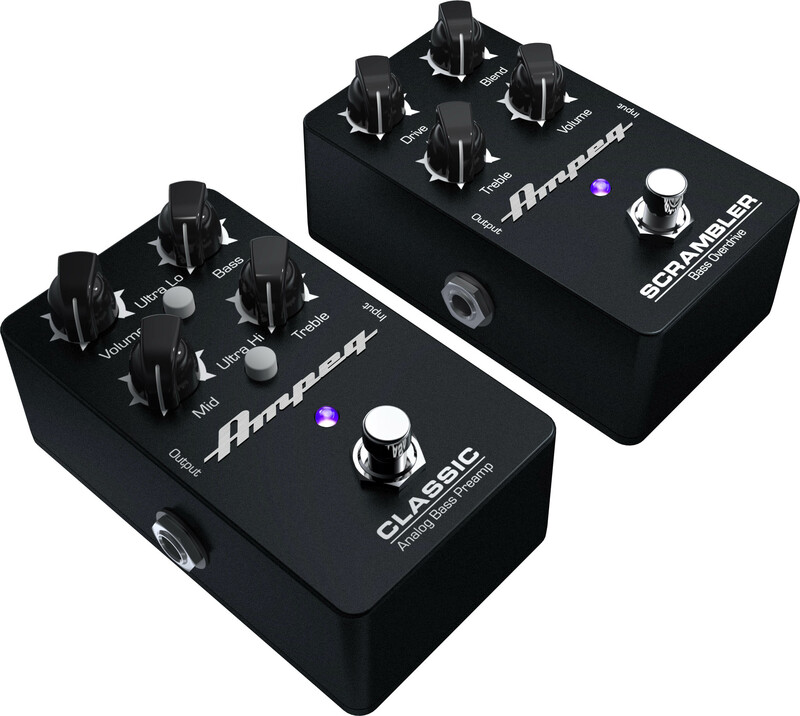 Ampeg today announces a big addition to its lineup of pedals with the launch of the Classic Analog Bass Preamp and Scrambler Bass Overdrive pedals. All-new dual-circuit Analog Chorus and flexible Optical CompressorANAHEIM, CA, USA – January 25, 2018 – Ampeg today announces the release of the all-new Liquifier Analog Chorus and Opto Comp Analog Optical Compressor pedals. The two new designs join the growing line of award-winning pedals loved by countless musicians around the world.The Liquifier Analog Chorus pedal delivers incredibly rich tones thanks to its dual chorus circuit. With this uncommon design, the Liquifier Chorus not only offers incredibly lush, dreamy chorus tones, but can push it in to another dimension allowing for a whole new level of creativity. Dialing in your perfect sound is easy too, with straightforward Rate, Depth, and Effect Level controls. In addition to sounding amazing, the Liquifier stands out visually as well with a beautiful Sparkle Purple finish. Los Angeles, CA - June 2016...Eva Gardner is a first-call bassist who’s held it down for the likes of Pink, Gwen Stefani, Mars Volta, Cher, and Telstar. You might say she was born to play bass. Growing up in a rock and roll family, her dad Kim Gardner was bassist for the legendary British Invasion band The Creation, and his Ampeg bass rig is among her earliest recollections.